Current drivers acting on the global specialty zeolites market include their growing scope of use in the industries of paints and coatings and plastics, where they are used to remove odor and improve adsorption of volatile organic compounds. The paints and coatings industry has always been a key end users of specialty zeolites, along with the construction industry. However, the global specialty zeolites market is being restricted by the growing preference and rate of use of other adsorbents, especially activated carbon and silica gel. This is having a negative impact on the demand for specialty zeolites in the paints and coatings segment. The growth of the plastics industry is likely to be another factor driving the global specialty zeolites market over the coming years. The global specialty zeolites market was valued at US$40.1 mn in 2015 and is expected to reach US$53.4 mn by the end of 2024, after expanding at a CAGR of 3.2% within a forecast period from 2016 and 2024. By geography, the global specialty zeolites market can be segmented into North America, Europe, Asia Pacific, Latin America, and the MEA. 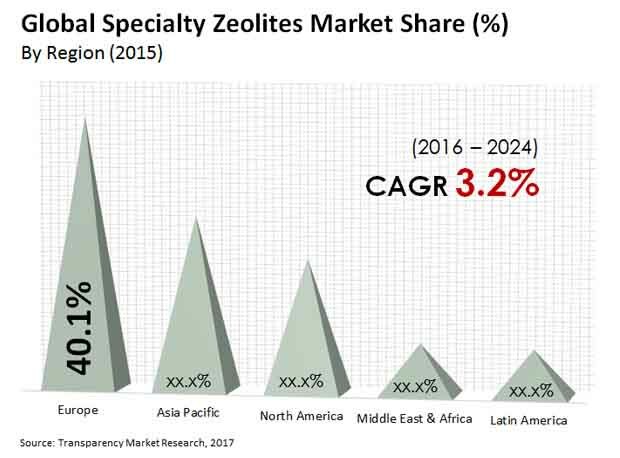 Europe accounted for the leading share in the global specialty zeolites market for 2015, followed by Asia Pacific and North America. Asia Pacific is projected to be a high potential region in the global specialty zeolites market during the forecast period, owing to a recovery phase in the global construction industry fueled by the rise in commercial construction and infrastructure activities in key APAC nations, such as China, India, Malaysia, Singapore, and Thailand. China is investing significantly in infrastructure development, especially in the construction of new healthcare and commercial institutions. India is projected to depict high growth in its construction activities and consequently its demand for specialty zeolites, possibly even greater than China by 2024, due to the growing urban population and increasing government investments in infrastructure development. The specialty zeolites market in the Middle East and Africa is estimated to offer comparatively less growth opportunities due preference for other adsorption products over specialty zeolites. Increase in demand for consumer goods and automobiles across the globe is estimated to boost the paints & coatings and plastics markets. All these factors are projected to drive the specialty zeolites market during the forecast period. Among the various end users in the global specialty zeolites market, the paints & coatings segment lead the revenue generation charts for 2015, followed by the segments of construction materials and plastics. The paints and coatings industry has seen a surge in the use of specialty zeolites recently, due to the implementation of stringent government regulations dedicated to eliminating volatile organic compounds in paints and coatings. Specialty zeolites can be used to make lightweight blocks for construction and decorative walls. Usage of energy-efficient building materials has increased significantly over the last few years and specialty zeolites can offer significant opportunities to develop new construction materials. They are also used in the construction industry to prepare high performance and lightweight concrete. Key types of specialty zeolites found commercially include USY (ultra-stable zeolite Y), ZSM-5, and SAPO-34. Minority types of commercially available specialty zeolites include ferrierite and SAPO-11. Very small quantities of specialty zeolites are used for adsorption purposes in paints and coatings, plastics, personal care, and construction materials applications. Key players in the global specialty zeolites market so far, include Tosoh Corporation, Arkema Group, BASF SE, Clariant, W. R. Grace & Co., Albermarle Corporation, Zeochem AG, Zeolyst International, Eurecat, and Honeywell UOP. Specialty zeolites are types of zeolites that require specialty synthesis, primarily high-pressure synthesis. Some specialty organic additives are also added during crystallization/synthesis. Small quantity of specialty zeolites are used for adsorption purposes in paints & coatings, plastics, personal care, and construction materials. The report estimates and forecasts the specialty zeolites market on the global, regional, and country levels. The study provides forecast between 2016 and 2024 based on volume (tons) and revenue (US$ Mn) with 2015 as the base year. The report comprises an exhaustive value chain analysis for each of the end-use segments. It provides a comprehensive view of the market. The study includes drivers and restraints for the specialty zeolites market along with their impact on demand during the forecast period. The study also provides key market indicators affecting the growth of the market. The report analyzes opportunities in the specialty zeolites market on the global and regional level. Furthermore, the report analyzes substitutes of specialty zeolites. It also provides the global average price trend analysis. The report includes Porter’s Five Forces Model to determine the degree of competition in the specialty zeolites market. The report comprises a qualitative write-up on market attractiveness analysis, wherein end-use and countries have been analyzed based on attractiveness for each region. Growth rate, market size, raw material availability, profit margin, impact strength, technology, competition, and other factors (such as environmental and legal) have been evaluated in order to derive the general attractiveness of the market. The study provides a comprehensive view of the specialty zeolites market by dividing it into end-use and geography. In terms of end-use, the specialty zeolites market has been segmented into plastics, paints & coatings, construction materials and personal care. End-use segments have been analyzed based on historic, present, and future trends, and the market has been estimated in terms of volume (tons) and revenue (US$ Mn) between 2016 and 2024. Regional segmentation includes the current and forecast demand for specialty zeolites in North America, Europe, Asia Pacific, Latin America, and Middle East & Africa (MEA). Additionally, the report comprises country-level analysis in terms of volume and revenue for end-use segments. Key countries such as the U.S., Canada, Germany, France, the U.K., Spain, Italy, Japan, India, China, Argentina, South Africa, and Brazil have been included in the study. Market segmentation includes demand for individual end-use in all the regions and countries. The report covers detailed competitive outlook that includes market share and profiles of key players operating in the global market. Key players profiled in the report include Tosoh Corporation, Arkema Group, BASF SE, Clariant, W. R. Grace & Co., Albermarle Corporation, Zeochem AG, Zeolyst International, Eurecat and Honeywell UOP. Company profiles include attributes such as company overview, number of employees, brand overview, key competitors, business overview, business strategies, recent/key developments, acquisitions, and financial overview (wherever applicable).